Premium interior rubber stair treads offer 12 designs and available with abrasive strips for added stair tread slip-resistance. For Commercial or residential stair tread use. Indoor use only. 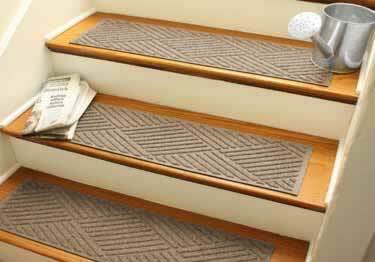 Representing a full line of Johnsonite Rubber Stair Treads recommended for interior use. They come 70 colors and 6 different designs. Premium interior rubber stair treads from Roppe offer many designs and available with abrasive strips for added stair tread slip-resistance. For Commercial or residential stair tread use. Indoor use only. Vinyl safety stair treads are available in raised rib design for Commercial, Industrial, Institutional, Apartment, Dormitory, and Residential applications. Indoor use only. Metal stair treads are made from heavy-duty extruded aluminum and non slip abrasive material that creates the perfect non slip stair tread features. Indoor/Outdoor use. 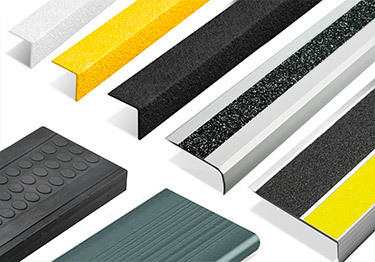 Our stair nosing products represent a wide range of rubber, vinyl and metal solutions for providing a safe and attractive stair. To properly eliminate slips and falls, fiberglass or plastic stair treads and covers provide safety for both commercial and residential stair tread applications. For both indoor and outdoor use. 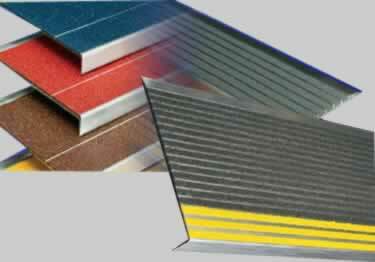 Latex and epoxy adhesive available for installing our Koffler Sales Rubber Stair Treads. Also includes epoxy nose caulk for securing the stair tread nose during installation.